She spent many years modelling in Italy where she became a household name. And on Friday, Australian stunner Megan Gale revealed she is teaching her two young children how to speak Italian. 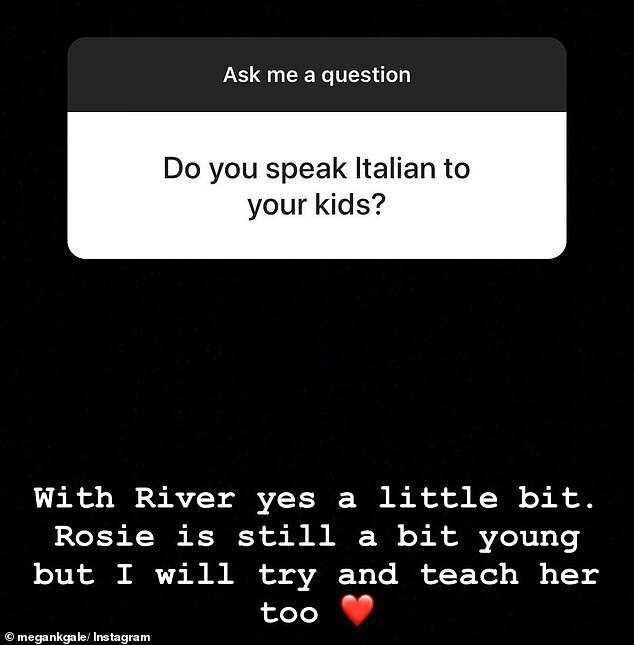 The 43-year-old was asked by a fan on her Instagram Story on Friday, if she spoke Italian to son River, four, and daughter, Rosie, one. 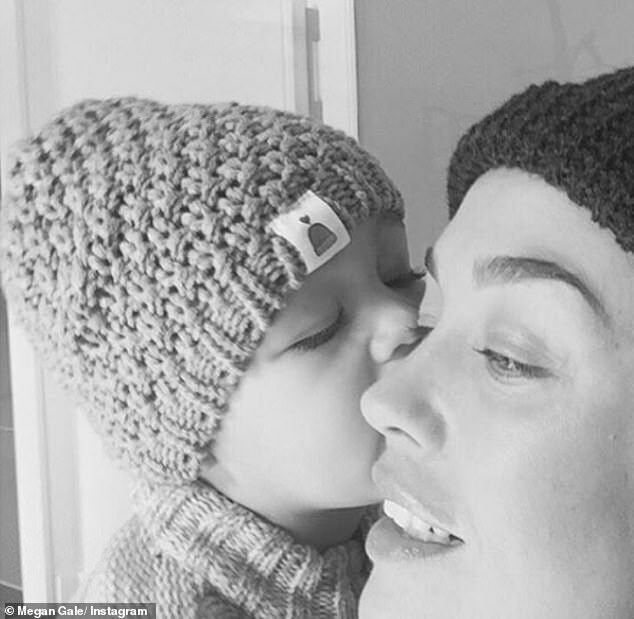 Megan now enjoys a quieter life in Melbourne where she is based with her partner, AFL star Shaun Thompson and their two children. The Perth-born stunner's modelling career kicked off in Italy started when she cast in a commercial for local phone network Omnitel in 1999, which was a hit with Italians - making her an overnight celebrity. She split time between Australia and Italy, but eventually relocated Italy where she was booking more jobs, including shoots with publications such as Vogue Italia, GQ and Maxim. Earlier in the question and answer session, another fan asked her if she enjoyed her experience in Italy. 'Yes it was amazing. It overwhelmed me at times... to be come famous to 60 million people overnight is a shock to the system of a 22 year-old girl far away from home,' she said. 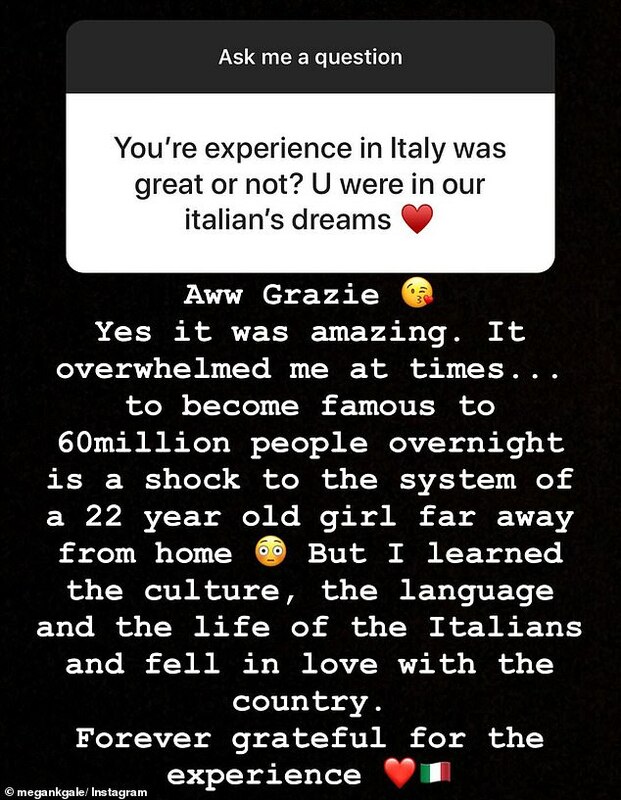 Megan said she was 'forever grateful for the experience' of learning the culture, the language and the Italian way of life. 'One of the best experience of my life and I miss it a lot. But so happy to be back and settled in Oz,' she added. Megan later landed a TV presenting role with travel program Getaway from 2005 to 2006 and became a swimwear designer, launching her label Isola in 2010. Megan also host Project Runway Australia in 2011 and became a judge on Australia's Next Top Model in 2016. They are proud and devoted parents to son River, four, and one-year-old daughter Rosie. 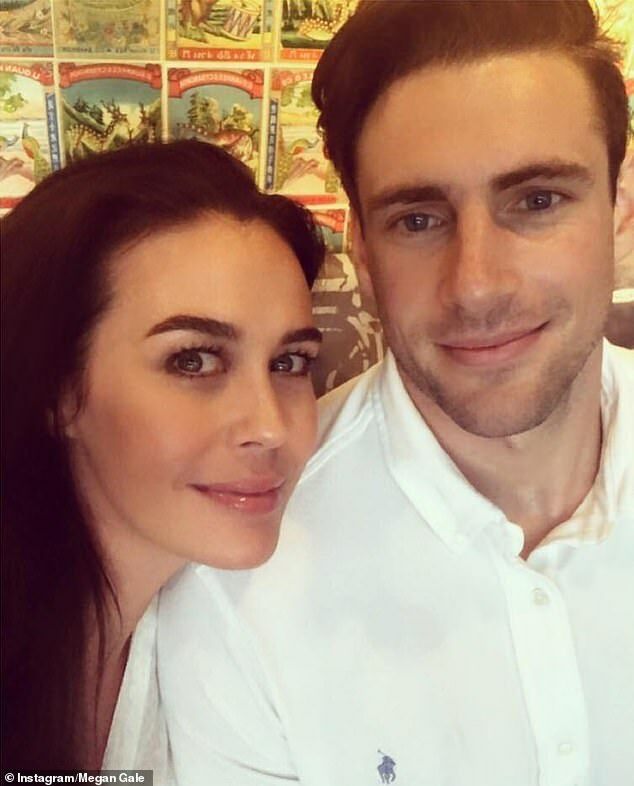 But Megan Gale, 43, and her fiancé Shaun Hampson, 30, enjoyed some well-deserved time off parental duties on Thursday night as they celebrated their relationship. Taking to Instagram on Friday, the model posted a photo of the pair out for dinner and opened up about how important it is for the couple to spend quality time together. 'The last few years @shampson and I haven’t gifted each other presents for Christmas but we've gifted presence,' Megan captioned the loved-up picture. She continued: 'As in each other's. We really don't have a want or a need for items off each other all the time and the best thing we can think of is to thoroughly enjoy each other's company. During an Instagram Q&A session with fans last month, the mum-of-two was candid as she discussed motherhood. While responding to a fan who asked about the possibility of having more children in the future, the model hinted they haven't ruled out welcoming a new addition. Megan responded: 'I love being pregnant, giving birth and having kids/being a mum. The beauty then thanked both of her children's grandmothers for pitching in, and revealed that her luxury of often being able to work from home is an added bonus. Megan also revealed that she regularly checks in with herself to make sure her kids are her first priority - and that often means completely switching off from the world. 'I'll do what is an absolute priority but I'll often shut the laptop and leave my phone in another room and go play with my kids and give them my 100 per cent full attention,' she wrote. She's one of Australia's most recognisable beauties, known for her luscious brunette locks. 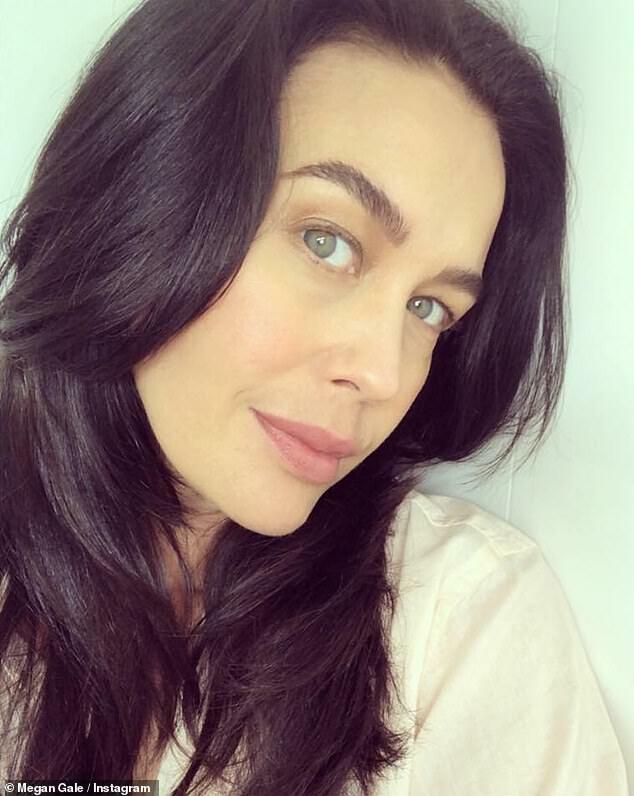 And in the new year, Megan Gale has opted for a change, opting for a darker shade and a new haircut. The 43-year-old took to Instagram on Saturday to show off the new cut, which featured more layers and a deeper brown tone than her previously highlighted look. She captioned the snap, 'Fresh hair. Darker. Layers', along with an emoji in the shape of a pair of scissors. Megan added that celebrity hairstylist Marie Uva was behind the new look, which she'd had done at Uva Salon in Prahran, Victoria. The mother-of-two also appeared to be largely makeup-free in the selfie, and she has explained her son prefers her that way. The model told Daily Mail Australia recently that River, four, doesn't like her wearing the old war paint. 'My son is actually always a fan of me with no makeup and not too dressed up. He likes me au naturel, which is a lovely quality he has,' she said. 'I like the fact that he likes me without makeup and I’ll encourage him to take that stance when he's older as well,' the brunette beauty added. The bikini designer and her partner Shaun Hampson share River, and Rosie, one. The Perth-born beauty and her partner recently told fans they won't be having any more children. She's the Amazonian beauty whose signature runway walk has her toted as one of Australia's top supermodels. But it appears not even Australian A-lister Megan Gale can stop herself from Instagram locking her out of her own account. Taking to her Instagram on Friday, the gorgeous 43-year-old looked fresh faced as she 'checked in' with her 416,000 followers after weeks of unexplained silence. 'I haven't been on Instagram for a really long time now, because basically I was locked out of my account,' she laughs in the video. 'Which was a tad concerning,' Megan confessed. While admitting she wasn't concerned at first, she reveals she gradually became more worried when the problem wasn't resolved by Instagram as quickly as hoped. 'I thought, "is this it? Is my account gone? Are all my followers gone? ",' she added. 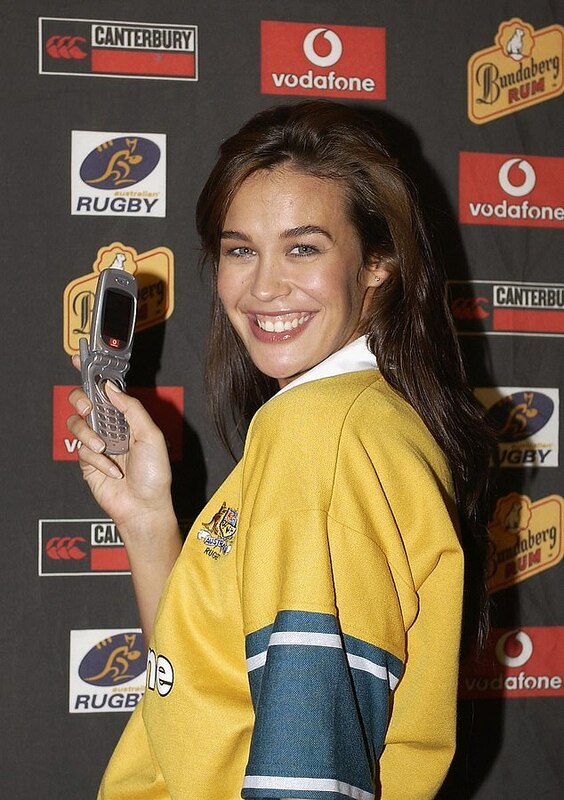 The former Australia's Next Top Model host then says she finally got the problem resolved and assures her legions of fans that she's now firmly back online. 'Not that you've missed anything particularly riveting or fascinating from me, but I am back and I do have some exciting things coming up very soon, so watch this space,' she says before ending the video. Although perhaps not riveting to her, fans were delighted to know that she had purchased a $3.12 million home in Melbourne with ex-AFL star fiancé Shaun Hampson in early March after house hunting for almost two years. The stunning Glen Iris property features four bedrooms, two bathrooms, and a large fully fitted study or office. The former host of Project Runway Australia's new digs also boasts a private hedged garden with solar heated pool and gym. Megan and Shaun share two children; one-year-old daughter Rosie May Dee and four-year-old son River. Megan did not divulge any further into why she was blocked from Instagram, but assured fans she was now back online and ready to answer all of her messages. 'If I haven't got back to you it's not because I'm slack, it's because I haven't been able to,' she said. Megan ricorda il suo primo spot.